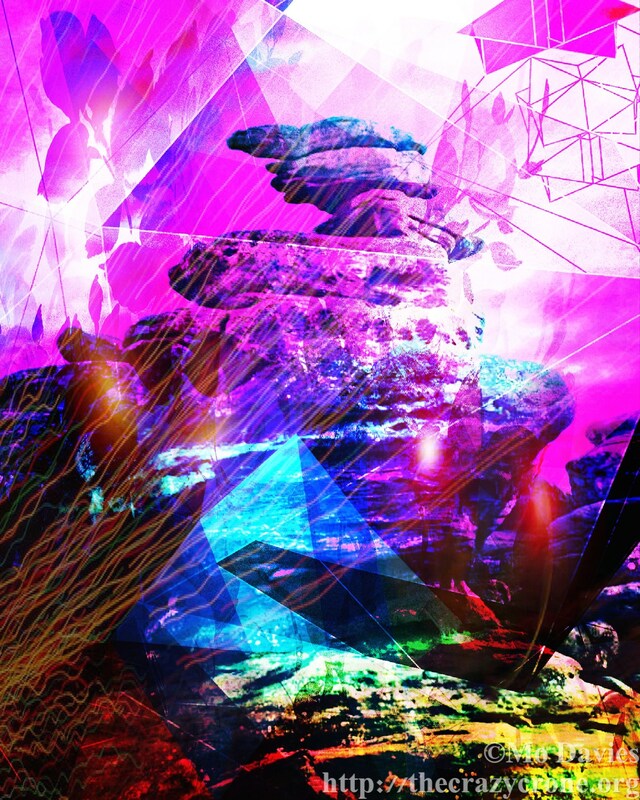 I created the above image from a photo my friend took of rocks at Brimham Rocks in North Yorkshire, UK. It’s a place of amazing rock formations which I hadn’t known about until my friend posted her pics on her Facebook timeline. When I first started creating art I used only photos I’d taken myself, but I have enjoyed opening up to photos that others have taken. It’s like weaving a web around the world of scenery, people and art. For the record, I’ve used photos of rocks by Jessica Winder, Jessica’s Nature Blog in the UK (http://natureinfocus.wordpress.com) Ann, the Republic of Ann, in the Smoky Mountains, US (http://therepublicof ann.wordpress.com) and my friend Sue Slater who lives in Lancashire, UK. When I’d completed the above image, it reminded me of the sci-fi I’ve enjoyed since I was a kid. Quatermass and Andromeda won’t be known by younger generations but I do remember being terrified by Quatermass and checking out my cupboards before I went to sleep to make sure no ET’s were lurking therein. I can vaguely remember Andromeda with Julie Christie but not the details. I loved the Alien series as well as, of course, Star Wars with Luke Skywalker, Darth Vader and so on. I also enjoyed reading sci-fi – Isaac Asimov, Arthur C. Clarke, Anne McCaffrey and the Dragons of Pern, Ursula K. LeGuin, Nigel Mackenzie who I’ve just found out was actually a woman writer, Kathleen Lindsay, and many more. I always remember as a kid reading a book by Nigel Mackenzie about settlers on Mars and the baddies having the blood sucked out of them by plant life on the planet – my eyes really bugged out at that story! So really the above digital art is my tribute to sci-fiction in all its forms, because I love it all. I love the imagination, the vision, the humour (sometimes!) and the contribution to a greater, wider understanding of our Universe. Wasn’t Clarke amazing? He was such an optimist; his stories always leave me with a sense of hopefulness. Yes, Clarke was amazing. I loved Asimov’s Foundation Trilogy plus his sense of humour. I remember tearing running down my face when I read “Christmas on Ganymede”.